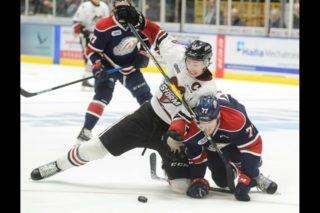 For the third time in 10 days, the Storm hooked up with their Highway 7 rivals with the Kitchener Rangers taking round three by the score of 5-2. The same two clubs will clash one more time before the holiday break when Guelph visits the Aud on December 18th. The Storm welcomed a pair of players back from injury for Tuesday night’s game with Taylor Beck back in action after a one-game hiatus and captain Matt Kennedy returning to the ice after missing the last 11 games and 16 of the club’s last 21. Holding the Rangers without a shot for almost six minutes, Guelph would jump out to a 1-0 lead at 5:35 of the first. On the ice for their first shift of the game, the fourth line of Frank Menard, Zack Mitchell and JP Labardo gave the visitors the early lead when Menard deflected a Ben Chiarot shot behind Brandon Maxwell. The Rangers would even the score and bring over 6,000 stuffed animals onto the ice just under seven minutes later after a Jeff Skinner shot hit the post and rebounded to Jason Akeson for a backhander past a sprawling Cody St. Jacques. Then with 5:16 to play in the first, Shane Prince jumped on a Guelph miscue behind their goal and dished to Julian Cimadamore for a quick shot to give the hosts their first lead of the night. Shots on goal in the first were eight apiece. For the second game in a row, the Rangers would take control in the second period by outscoring Guelph by a pair. Jeff Skinner would spot Kitchener a two-goal cushion grabbing a Storm clearing attempt and sweeping in for a quick shot past St. Jacques. Conor O’Donnell would cut the Rangers lead to 3-2 minutes later on a snapshot in transition that caught Maxwell on his heels. Two Kitchener powerplay markers in the next five minutes would prove all the insurance the home side would need. Matthew Tipoff would make it 4-2 Kitchener with his 14th of the season off a nice backdoor feed by Jeremy Morin. The Rangers would build their biggest lead of the contest with their second goal on the man advantage when Skinner one-timed the game’s last tally past St. Jacques. Kitchener badly outshot Guelph in the middle frame firing 25 shots on goal compared to 12 by the visitors. In the third, the two teams continued to battle in a chippy affair, but neither team would manage a goal. 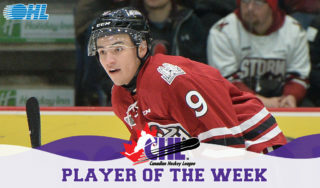 The Rangers would hit St. Jacques with nine shots while Guelph recorded eight. 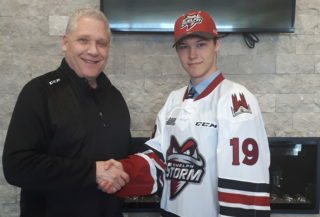 The Storm will play two more Midwest Division tilts this week beginning Friday night at home for Teddy Bear Toss Night versus the Owen Sound Attack. On Saturday night, Guelph will travel to London to square off with the Knights before welcoming the Kingston Frontenacs to the Sleeman Centre on Sunday afternoon in a 2 pm start. 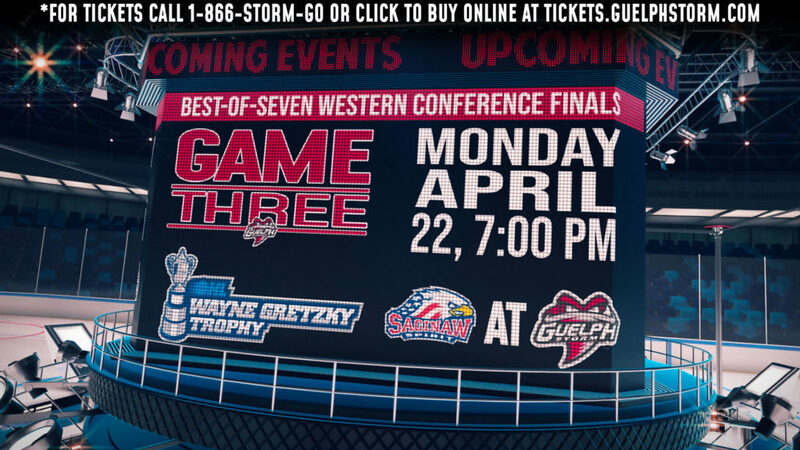 For tickets visit or call the Storm box office at (519) 837-9690 or purchase online at GuelphStorm.com. 1st Period-1, Guelph, Menard 2 (Chiarot, Comrie), 5:35. 2, Kitchener, Akeson 12 (Skinner, Tipoff), 12:13. 3, Kitchener, Cimadamore 3 (Prince), 14:44. Penalties-Sisca Gue (hooking), 0:42; Crescenzi Kit (check from behind), 7:12; Latta Gue (inter. on goaltender), 7:56; Prince Kit (roughing), 17:49; Holland Gue (inter. on goaltender), 18:38. 2nd Period-4, Kitchener, Skinner 22 1:38. 5, Guelph, O’Donnell 5 (Carroll), 8:23. 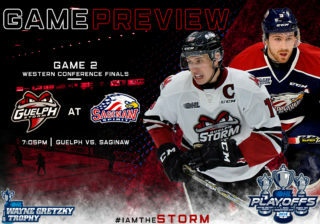 6, Kitchener, Tipoff 14 (Morin, Murphy), 9:32 (pp). 7, Kitchener, Skinner 23 (Akeson, Moore), 14:26 (pp). Penalties-McNaughton Gue (fighting), 3:16; Kelly Kit (fighting, game-persist fight), 3:16; Sandlak Gue (roughing), 3:27; MacKinnon Kit (roughing), 3:27; Comrie Gue (roughing), 9:19; Carroll Gue (roughing), 12:53; Andersson Kit (roughing), 12:53; Lofquist Gue (holding), 14:03; Morris Kit (slashing), 15:55; Latta Gue (slashing), 18:38; Skinner Kit (slashing), 19:28; Kennedy Gue (instigator, fighting, misc-inst), 19:31; Maxwell Kit (unsportsmanlike cnd. ), 19:31. 3rd Period- No Scoring.Penalties-Catenacci Kit (holding), 6:13; Holland Gue (elbowing), 10:12; O’Donnell Gue (misc-usc), 15:16; Comrie Gue (roughing), 19:31; Skinner Kit (roughing), 19:31; Chiarot Gue (roughing), 19:56; Prince Kit (roughing), 19:56. Shots on Goal-Guelph 8-12-8-28. Kitchener 8-25-9-42. Power Play Opportunities-Guelph 0 of 5; Kitchener 2 of 8. 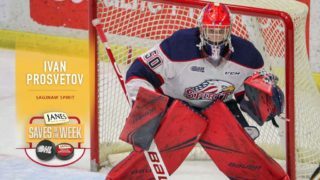 Goalies-Guelph, St. Jacques 7-9-1-0 (42 shots-37 saves). Kitchener, Maxwell 10-6-0-2 (28 shots-26 saves). Referees-Craig Spada (10), Keith Kaval (14). Linesmen-Jason Finley (37), Raymond King (95).